Bitter winter greens are abundant right now, and — rich in vitamins and deep with taste — they are a delicious way to keep eating fresh salads through the long winter months. While bitterness can signal potentially dangerous chemicals in unfamiliar foods, it also brings complexity and balance to dishes when produced by plants we know are safe to eat. 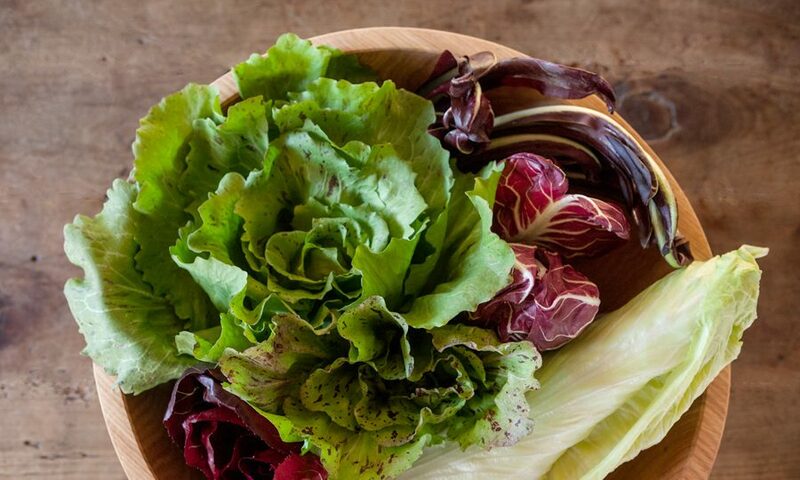 Some of our favorite bitter lettuces are in the chicory family, a wide and varied group that varies in color, shape, and taste from mild to intensely bitter. As a cool weather crop, chicories are a great choice for fall and winter salads, and combine well with rich ingredients such as sharp cheeses, nuts, and fruits. Their bite and texture stand up well to a strong dressing, such as the traditional Italian preparation that pairs them with with anchovies, garlic, and lemon juice. Adding vinegar or lemon juice helps cut the bitterness of harsh chicories. Chicories are also delicious roasted, grilled, or seared. Cichorium endivia, or endive, includes both curly and broad-leafed varieties. Curly endive can be aggressively bitter, which can be mellowed by cooking and mixing in a salad with other greens like frisée. The blanched heart of curly endive is known as frisée. It’s softer and best eaten raw in a salad, dressed with a warm vinaigrette. Once washed and spun dry, the leaves will last for up to 5 days in the refrigerator. Escarole has flat, broad, green leaves with firm, white stems. The inner leaves are less bitter while the outer leaves can be shredded to add a hint of bitterness to soups or stews. Seared or wilted escarole is a perfect base for a fried egg. Perhaps due to its red color, radicchio is the most easily recognized of the chicory family. A handful of types of radicchio have protected geographic indication (Indicazione Geografica Protetta, or IGP) of where they are grown in Italy, to guarantee their origin of production. Of the four varieties of radicchio, Chioggia is the most commonly known in the U.S., round in shape and resembling a red cabbage. While it can keep well for days in the refrigerator, it begs to be served fresh from the garden in salads with apple or fennel. You can also grill radicchio with olive oil, salt, and a drizzle of balsamic vinegar for a tasty side dish. Puntarella, also known as asparagus chicory, are the inner stalks of the Catalonian chicory. Not widely available in the U.S., it is a staple in Roman cuisine during the winter months. For a substitute closer to home, try Belgian endive with garlic, lemon juice, olive oil, and anchovies. This entry was posted in Eat Good Food and tagged chicory, winter.